It’s the end of Top Gear Season 22, but in reality it’s the end of Top Gear as we know it. The boys will be back, of course, but tonight is the night that we bid farewell to our old friends at their own home. Here’s everything you need to know. The last episode is a 75-minute special that will air tonight at 8 PM in London (3:00 PM in New York) and will be easy to watch on BBC2... if you’re in England. The rest of us are going to have to be a little more creative or wait for it to air on BBC America (if it ever does). Please drop any ideas for how to watch it in the comments below. 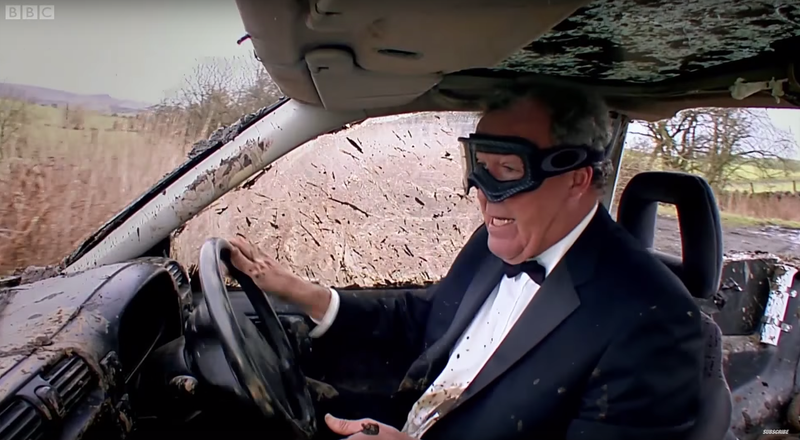 In one of the challenges the trio of James May, Richard Hammond, and Jeremy Clarkson go on an adventure in trucks and an XJ Jeep Cherokee and a truck-ized Isuzu Rodeo shows up. I don’t know how Chris Evans is going to be as a host, but good luck looking as ridiculous in a tuxedo than James May. This episode is reportedly cobbled together from two other episodes shot when Clarkson still had a job and, according to him, “One of them is quite good.” Buuuuuuuurn. All of this is bittersweet for fans as we feared that we’d get nothing out of the end of Top Gear and at least we get a little bit of closure. It’s an amazing thing that a show about old pasty British dudes and cars is one of the most popular non-sports shows on the planet. And that we got 22 season of it is itself kind of a miracle, too.